It’s not like Transylvania has ever been a great place to live. It’s dark and scary and that whole Dracula thing keeps it off the tourist trail. Lately, though, it’s worse than normal. 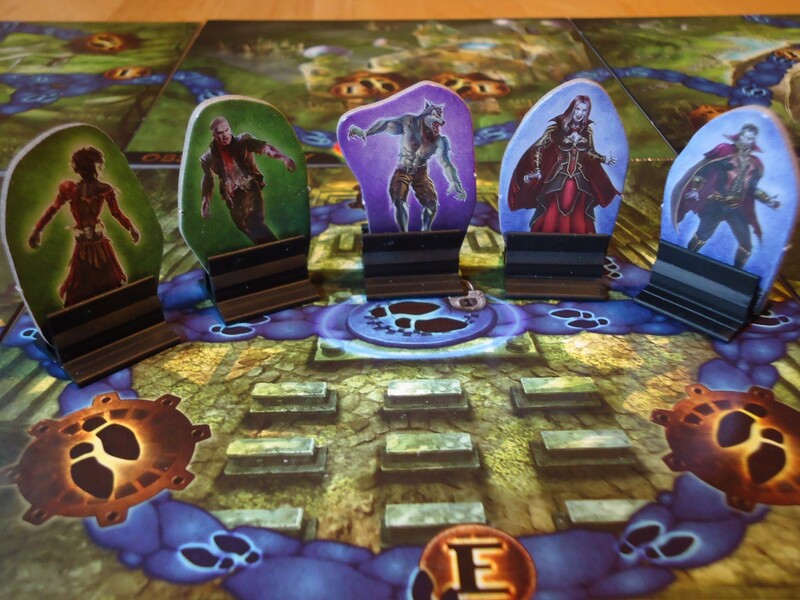 A curse has fallen over the city and more monsters than usual are terrorizing the populace. The government, in an attempt to save the city, has put out a call for fearless adventurers to come in and rid the city of this monster plague. You, of course, are one of these fearless adventurers. You want to save the city! (And pocket the hefty reward while you’re at it. Hey, adventurers have bills, too.) Your goal is to either kill the monsters or find the information necessary to break the curse. Do that and you will be known as the greatest adventurer ever. One teensy problem: You may end up transformed into a monster yourself and then, well, you’re going to kill your fellow adventurers. Oops. Not exactly an idyllic vacation, but all in a days’ work for a brave hero like yourself. In Transylvania: Curses and Traitors, you take on the role of one of many adventurers trying to rid Transylvania of the vampires, zombies, and werewolves that are overrunning the place. Your goal is to either slay a monster or collect enough knowledge cards to break the curse. If things go wrong, you may end up transformed into a monster. In that case, your goal becomes killing the requisite number of your fellow adventurers to win the game. 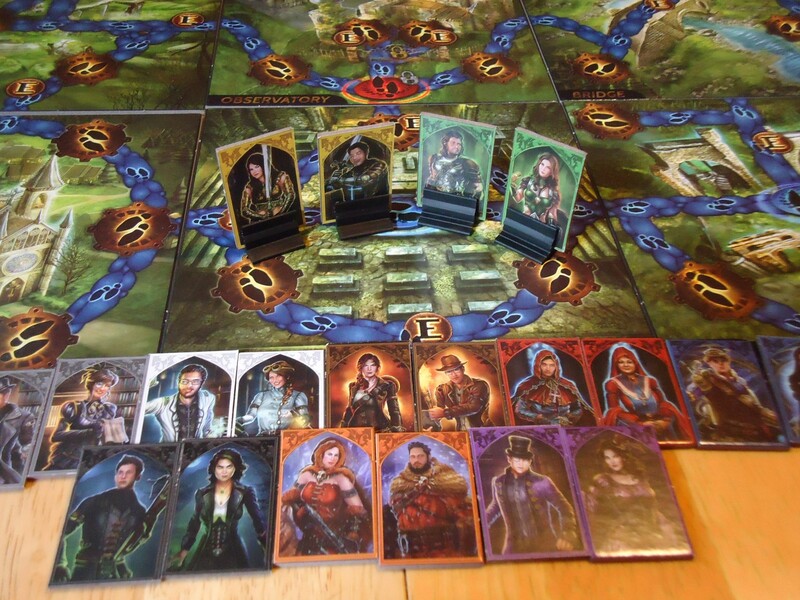 To begin the game, each player draws one Adventurer Ability card at random and takes the corresponding standee and Adventurer card. This will be your character for the game. Find the Church tile (which is always the starting tile) and set it in the middle of the table. 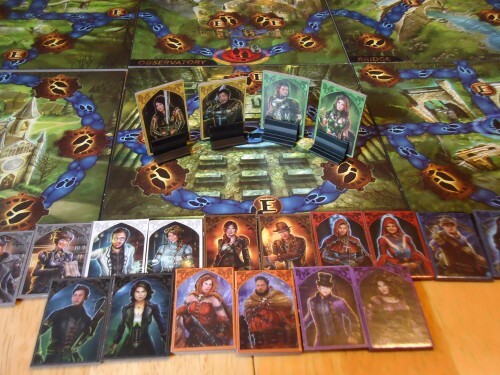 Once the set up is complete, each player draws one Discovery card from the deck to form their starting hand. Each player’s turn consists of three phases: Exploration, Determination, and Cleanup. A brief summary of each phase is provided below. 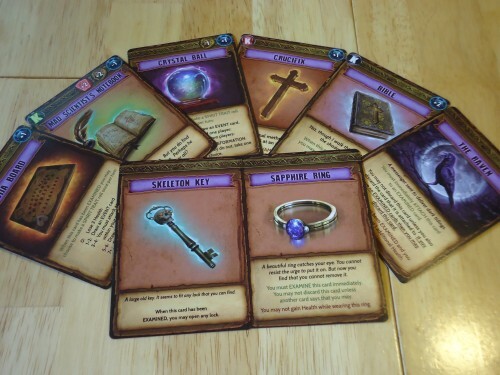 The character cards. One side is male, the other female. Exploration: This is the meat of your turn. During this phase you may move, acquire Discovery cards, resolve events, examine Discovery cards, discard one Discovery card, and/or attack monsters. Not all of these actions will be available on every turn, and you may choose not to do them all even if they are. When you move, you may move up to the number of spaces equal to your character’s movement value. You do not have to move all the spaces if you don’t want to, and your movement does not have to be continuous. You may move, perform other actions, and then continue moving until you reach the limit of your movement. If your movement takes you to the edge of a tile and you wish to continue, take a new tile from the stack, lay it adjacent to the current tile so that the pathways line up, then continue moving onto the new tile. Some of the tiles that make up the board. If your movement lands you on a space with a monster, you may attack it. A Trait Roll determines who wins. If you lose, subtract the difference between the die rolls of the victor and the loser from your Health total. If your health drops below 1, your Adventurer dies. After death, your Adventurer regenerates as either another Adventurer or as a monster, depending upon which cards you were holding at the time of death. Each player may keep four Examined Discovery cards in front of them, as well as four unexamined cards in hand. When a Discovery card has been examined, any events or trait modifiers are in effect and remain in effect unless the card is removed via a successful challenge or discarded. You may examine one card per turn. Unexamined cards are kept in your hand (up to a maximum of four) but their effects are not in play until they are Examined. Determination: If you tried and failed to gain at least one Discovery card during your Exploration phase, you may choose one of your Adventurer’s traits and perform a Trait Roll to attempt to increase the value of one of your traits. If the roll is successful, you will increase the value of the chosen trait by one, meaning your next Trait Roll might be easier to win. 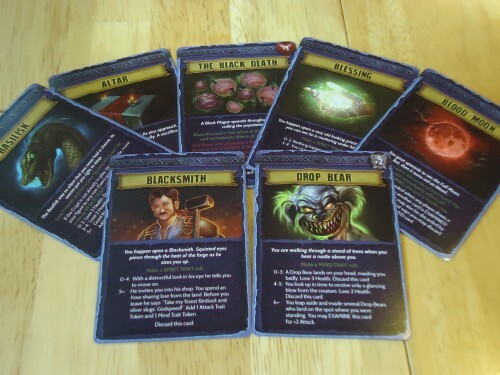 Cleanup: If you have more than four Discovery cards in hand at the end of your turn, you must discard down to four cards. If you collect the specific cards required for monster transformation, you may transform into that monster. You are not required to reveal your transformation at the moment it happens. You may keep your secret, continue to play as an Adventurer, and transform on a later turn. Once you’ve revealed your transformation, you will play the remainder of the game as a monster. Once you are a monster, your victory condition changes and you must kill the requisite number of adventurers to win. You will no longer be exploring and gaining Discovery cards. Instead, you will simply move and attack. You may only attack Adventurers when you occupy the same space, so movement needs to be planned accordingly. Each monster has unique special abilities to aid you in your killing efforts. This is just a brief overview of the gameplay, designed to give you a sense of the flow of the game. 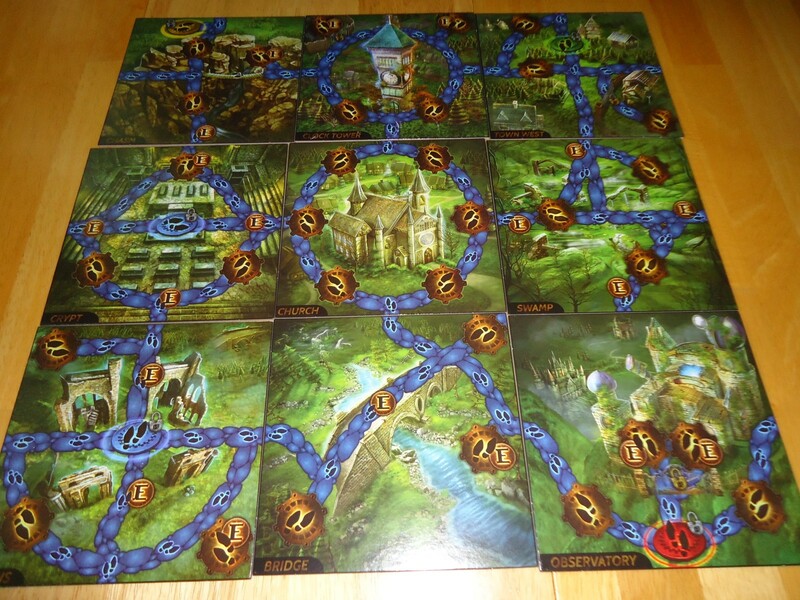 Each situation has its own rules and exceptions and to cover them all would take more space than I have here, but in general you are moving around the board, exploring the tiles, encountering monsters and other adventurers, performing Trait Rolls, and obeying the cards as required, all in an attempt to win as either the Adventurer or monster you are. Save Transylvania Or Give It To The Monsters? I jumped on the chance to review this game because it looked like it offered everything I love in a game. A modular board so that every play is different, a really cool theme and artwork to match, and a great narrative that would lead to those, “Remember when…” moments that are fun to talk about months after the game has ended. I wasn’t disappointed. The characters, both male and female. The rest of the components are a pleasure. The art is attractive and very thematic. My only gripe is that the character cards are incredibly slick. They will slide everywhere when you pick up the pile if you aren’t careful. And when they hit the ground, they just surf along. During our first game, I had to fish cards out from under the refrigerator after they slid across the kitchen floor. The rule book is great. Everything is well explained with pictures and examples. The text is large, as well, which is easy on the eyes. The rules aren’t difficult to begin with, but the presentation of the book makes it very easy for non-gamers and first-timers to jump right in and start playing. A lengthy read-through and rules explanation isn’t necessary. Just start playing and then consult the book when you need to take an action. I love rule books like this because they just make it so easy. This game itself did not disappoint me, but I can see where some people might be disappointed by it. This is what I would call an “experience” game, where it’s less about the strategy and more about the narrative. When I play a game like this, be it Fortune and Glory, Touch of Evil, The Adventurers, Betrayal at House on the Hill, or Transylvania: Curses and Traitors, I go into it knowing that it’s going to be low on strategy and high on luck. I also know that you can’t be too invested in winning or losing because your success or failure is mostly going to come down to the roll of the dice or the draw of the cards. You’re playing for fun, not for serious bragging rights. Some of the events that may happen to you. These games are like following a movie script and, as such, the actions are often more scripted than some. The cards will tell you what to do and your major choices come down to where to move and whether to attack/challenge someone or roll the dice for a discovery. The game is less about strategic decision making and more about riding along on the story that the game is creating. And that’s fine with me. When I play a game like this, I’m not looking for a brain burning, strategic experience. I’m looking for an hour or so’s worth of entertainment and some laughs and groans with my friends. The addition of the traitor/ability to become a monster does add something to Transylvania that many of the other games I mentioned do not have. When you transform into a monster, you don’t have to reveal your transformation immediately. You can continue to play as an adventurer for as long as you want and only reveal your transformation when it benefits you to do so (but you can only reveal on your turn and you cannot win as an Adventurer if you have the cards to become a monster). Since there can only be one of each type of monster on the board, you may not have to transform at all if, say, someone else transforms into the vampire before you do. If that happens, you may discard your transformation cards and keep playing as an Adventurer. 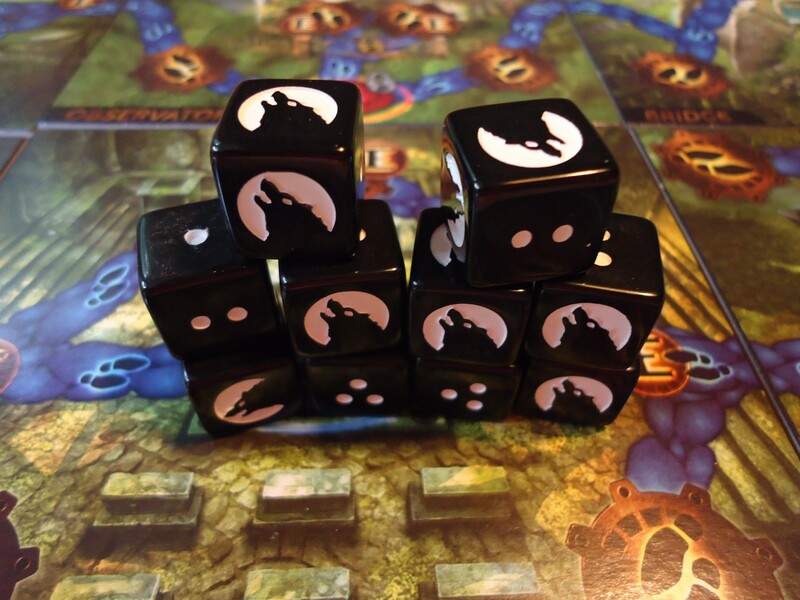 You’ll howl at the moon for these dice! This adds a little doubt to the game, with players wondering who might be an unrevealed monster. Do you get close to another adventurer who, if they transform, might be able to kill you quickly, or do you try to stay away from everyone else, even though it might mean missing out on discoveries that could help you? There is also some strategy involved in deciding when or if to reveal your transformation. Do you reveal, or do you hold out and hope that someone else reveals as your monster before you, meaning that you don’t have to transform at all? Betrayal at House on the Hill, a comparable title, adds a similar traitor mechanic, but only one player becomes the traitor in that game. In Transylvania, multiple players can transform at any time, so just because one monster is out on the board already doesn’t mean that everyone else is safe. This adds a level of mistrust in Transylvania that is really fun and interesting. This game is also completely competitive. 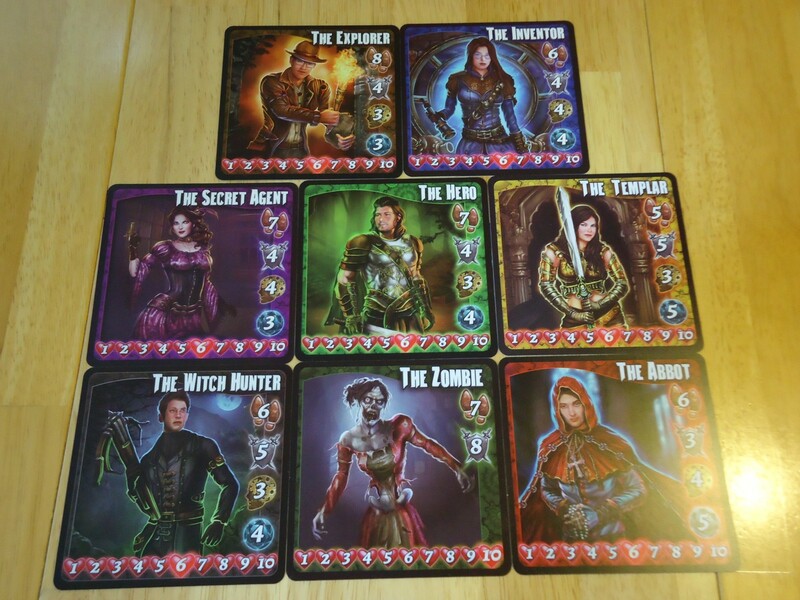 Unlike Betrayal, which is played cooperatively until the traitor is revealed, Transylvania has everyone fending for themselves from the beginning. It may behoove you to help each other in some cases, but you only want to do so if you’re going to benefit in some way. This is a game where your fellow Adventurers can pilfer your loot from your corpse if you die, so it’s not a kumbaya-warm-and-fuzzy sort of game. Some of the discoveries you can make. Speaking of dying, death does not mean elimination from the game. Your character regenerates, albeit without all of the cool stuff he or she had acquired up to the point of death. If you died holding the required cards to transform into a monster, you come back as that monster. If not, you come back as another Adventurer. I appreciate this touch because I hate being eliminated from a game. Yes, it’s harder to win once you die and lose all your loot, but since winning isn’t the main point of this game, it’s just nice to be able to keep playing. This game is not difficult, but that’s not a bad thing. Yes, there’s lots of luck involved and many of the decisions are straightforward. However, it’s just a lot of fun. It’s simple to play and learn and each game tells a different story. It’s the sort of game that you talk about after it’s over when you and your friends rehash the story that you just created. It’s not the sort of game that you get out when you need a brain burning, challenging night. It’s the game you get out when you just want to have a rollicking good time, chuck some dice, and chase some monsters (or be chased by them). Transylvania doesn’t do too much differently from other experience-type games, but it does succeed in delivering a solid, fun, entertaining story. If you share my enjoyment of these movie-like games, you’ll probably enjoy Transylvania: Curses and Traitors. 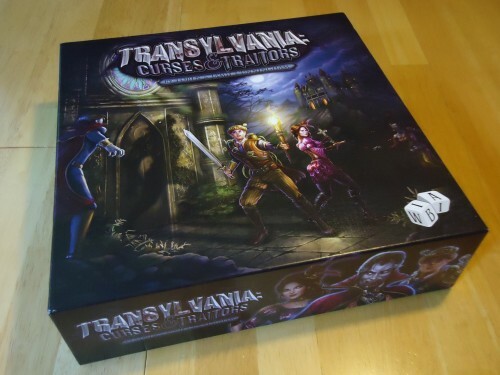 iSlaytheDragon.com would like to thank WIBAI Games for providing us with a review copy of Transylvania: Curses and Traitors. The characters and monsters all come in both genders. Great artwork, the game drips with theme. Rules are easy to learn and play can begin immediately. No player elimination. Characters regenerate. The game is an experience and a story; just a rollicking good time. That there can be multiple traitors at any one time adds extra tension and mistrust. The character cards are slick and will slide everywhere. Lots of luck in the die rolls and card draws. Decisions are straightforward and simple.